Last week, nominees were announced for the Outstanding Women of Laurier award, which recognizes achievement in athletics, the community and the classroom. 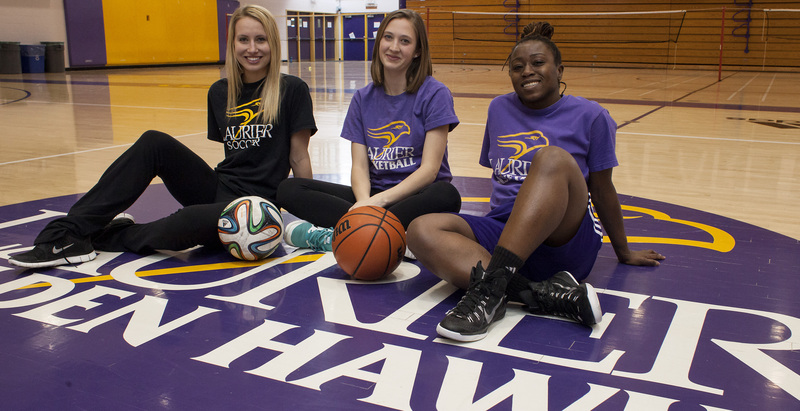 “The female athletics teams here at Laurier are a very strong group of girls. We’ve represented our school well and I think that there are leaders throughout every single team,” said women’s soccer forward Emily Brown. Brown, a fourth-year sociology major, has found herself an OWL finalist for two consecutive years. But despite her familiarity with it, the shine of the honour has not yet worn off. “I think it’s a great program where we can celebrate all these strong female leaders that come here to Laurier and go out in the community and get involved. I think it’s a really good thing to be able to celebrate that,” she said. Brown is joined by two first-time finalists, Lee Anna Osei and Sam Jacobs. Osei and Jacobs were both members of Laurier’s women’s basketball team, which dazzled by putting together a 17-3 regular season. According to Jacobs, a fourth-year kinesiology student and the vice-president of Laurier’s Letterman Society, the women’s basketball program has a mentality that fosters leadership. “It sort of speaks to the values we have within our team,” said the guard. Jacobs advised younger members of the athletic community, and Laurier community in general, to take any opportunity they can to become involved. “Just reach out. There’s tons of opportunities so talk to other athletes, talk to your coaches. Even if you’re not an athlete, talk to other people in the community — that way you can get involved,” she said. Osei, fifth-year history major, has had an interesting journey on her way to becoming an OWL nominee. She made stops at two universities in the United States before becoming a Golden Hawk. Last year, Osei served as a student ambassador at the annual OWL luncheon. She pointed to this as an inspirational moment and something that helped shape her as a leadership figure. “To see all the powerful and strong women that were there was definitely inspiring, and I thought to myself if there was any chance I could be in the same position the following year I would be over the edge about it,” she said. With her Laurier career coming to a close, Osei reflected on her long road to Laurier and elaborated on her goals for the future. “A lot of my friends that I grew up with have yet to be in university, but that’s something I want to change,” she said. The tenth annual OWL luncheon is set for March 25 at the Waterloo Inn Conference Hotel, with keynote speakers Olympic gold medalists Tessa Virtue and Scott Moir.